While his brother, Aidan, has been looked on with admiration, Eamon Evernight has always frightened people with his massive size, flame-red hair, and rumored supernatural abilities. After their father arranges a marriage for Aidan, it’s Eamon who writes his brother’s betrothed at Aidan’s request. What should have been a simple task turns unbearably complex when Eamon begins to fall for the witty Lady Luella Jane Moran. Eamon would never betray his brother, but how can he stand by and watch the woman he loves marry someone else? 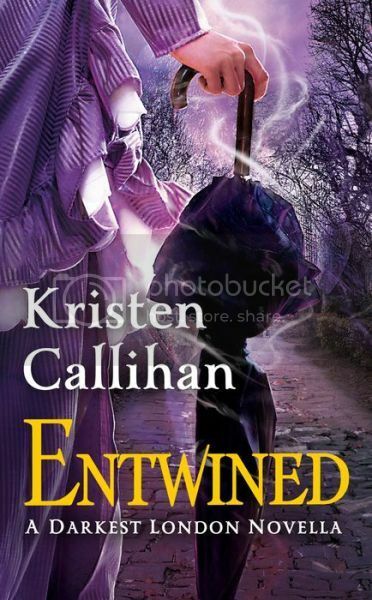 Prepare to be utterly charmed by Kristen Callihan’s Entwined! Eamon and Lu will have you smiling, sighing, and falling wholly in love with both of them from the very first page. Eamon’s a man who is dismissed by many because of his looks. It’s their loss, for he’s a talented, intelligent, and wonderfully giving man who is sure to make you envy Lu her good fortune in capturing his heart. As for Lu, she’s a sassy, fun heroine who – like Eamon – isn’t quite who she presents herself to be. It was delightful watching the layers be peeled back on both of these characters as they fell in love, first in letters, then in person. Ms. Callihan’s writing simply sparkled in Entwined and the interactions between Eamon and Lu gave me that lovely warm and fuzzy feeling. Though Entwined takes place a few decades before Ms. Callihan’s Darkest London series, the end of the story does tie into the third book, Winterblaze. Eagle-eyed readers might recognize Eamon and Lu’s granddaughter Holly Evernight from Winterblaze, along with Eamon’s inventions which come up in said book as well. If you haven’t read the Darkest London series, you can still read Entwined without feeling lost. Ms. Callihan never fails to entertain and Entwined is no exception. I absolutely adored Eamon and Lu and I hope we see much more of their family in future Darkest London books!